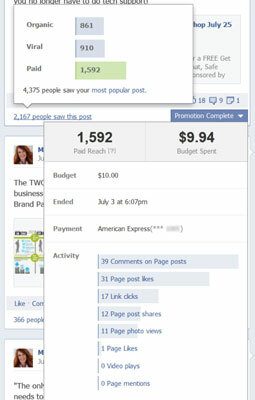 Sponsored posts are the best, no-brainer entry point into Facebook promotions for your business. Status updates are filtered by Facebook’s EdgeRank algorithm, which places in news feeds what it deems to be the most relevant content. Business pages pay a small amount to enhance the views of a single update. There aren’t many better ways to spend less than $10 when you can get the kind of results shown. For $9.94, this post received a total of 2,167 views. Organic: The number of people who visited your post or saw the post in their home page news feed. Viral: The people who saw your post when it was shared by a friend. Viral reach also counts the likes, comments, and further shares by others. Paid: The number of unique people who saw the post from a sponsored story position. 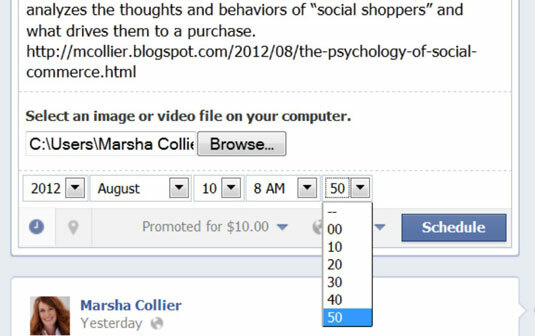 When you prepare your sponsored post, clicking Promote at the bottom of the text box displays a menu where you can decide on your budget (based on Facebook’s reach estimates) and the duration (1 to 3 days) of the promotion, as shown. Selecting the budget for your sponsored post. You may schedule what time or date your post (promoted or not) launches on your business page. At the bottom of the text box in the left corner, click the small clock to display the year, month, date, and time. Make your selections, and then click the Schedule button, shown in the figure, to schedule the post. Scheduling your post for a future date. Estimating the best time to post isn’t easy. 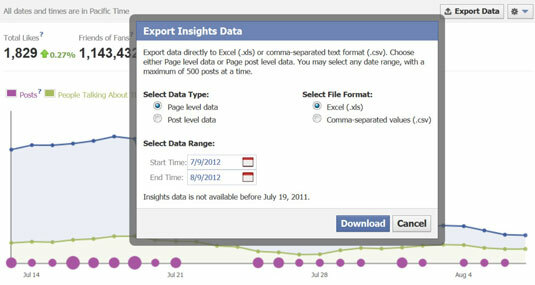 When you have engagement on your fan page, Facebook’s Insights give you quite a bit of data on your posts. If you correspond individual posts with the data on visitor actions, you can analyze which content (and time of posting) performs best on your page. To dive in and get a clearer look, click your page’s Insights link, which appears in your admin panel at the top of the page, and then export and download a CSV or Excel file of the last 28 days’ worth of data. Requesting a download of your data from Insights. One caveat: when you export this data from your fan page, you might be overwhelmed with one of the largest Excel data packages you’ve ever seen, with dozens of sheets and numerous columns of never-ending data points. Each data point is split into three sets: daily, weekly, and 28 days. The tone and mood of Facebook users move too fast for long-term data examination. On Facebook, 28 days is a long time. You can probably delete most of the long-term data. Keep the daily numbers and 7-day data points and you still have way too much data! Luckily, there is a comprehensive online service that does the analysis for you. 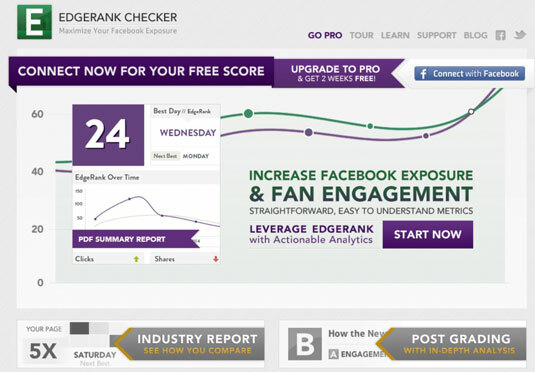 EdgeRank Checker can analyze your posts and translate their effectiveness into easy-to-understand, straightforward metrics, as shown in the figure. The EdgeRank Checker website gives you free data on your business page. EdgeRank is an algorithm that ranks objects in the Facebook News Feed. Pages with high EdgeRank Scores will be more likely to show up in the news feed, than Pages with low EdgeRank Scores. EdgeRank is made up of 3 variables: Affinity, Weight, and Time Decay. Affinity is dependent on a user’s relationship with an object in the news feed. Weight is determined by the type of object, such as a photo/video/link/etc. The last variable is Time Decay, as an object gets older, the lower the value. Each post is compared to others you have posted. By studying their analysis, you can figure out which type of post resonates most with your Facebook audience. Sometimes reading their examination of your posts feels like a big dose of tough love. If you subscribe to their Pro plan, you not only find out what you’ve done wrong or right in your engagement but are also given constructive criticism (through data analysis) along the way. As a small-business owner, you don’t have hours to spend trying to analyze Facebook’s reams of data. Use EdgeRank Checker instead. Facebook offers businesses the opportunity to sponsor their pages or individual posts through sponsored stories. These differ from the sponsored posts, which appear in the news feed. A sponsored story (linking to a page or a specific post) appears as an ad in the right column of the home news feed or in the right column next to your timeline. Sponsored stories offer targeting options so that you can greatly narrow the audience for your ad. You can target the post to a multitude of parameters, such as age, gender, interests, relationship status, language, education level, and workplace or location (country, state, city). Many further targeting options are available, and the cost of your ad varies based on your selections. People visit Facebook for social interaction and are less likely to click an ad unless the ad is for something that really interests them. Ads (and sponsored stories) consist of a picture and a line of text, making it difficult to select just the right words to attract clicks. Sponsored stories look like Facebook ads and do a better job of honing in on those who are not fans (or friends of fans) of your business page. What are the differences between a sponsored (promoted) post versus a sponsored story? 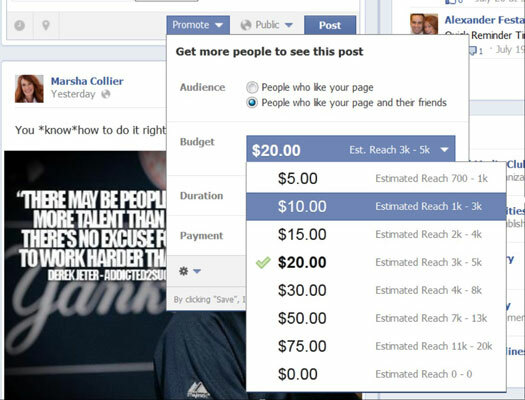 The promoted posts cost far less and garner more results. For a small business, start small. Stick with quality content and occasional sponsored posts.